That’s what I ask many people who want to know how I’ve managed to live a life of travel for 20 years. I’m currently wearing a dress I’ve had since Savannah was born. It’s vibrant red and orange paisley, makes my chakras happy, and still has a year or more left in it. I wear it over and over again so I can have a wardrobe that lasts and fits into a suitcase. Sometimes I feel a little awkward as we’re in the public space a lot through our photos and videos and public speaking. But, who cares if people see me wearing the same thing? It represents a lifestyle choice to have more freedom, joy and moments that matter. Embracing more travel in your life first starts with a decision and then a commitment. Once you’ve got that checked off, you can find clever ways to hack into travel to make it cheaper. PLUS, if you’re a superb travel hacker, you’ll find ways to earn money as you travel so you can continue doing it for 20 years. You can’t get a better hack than earning as you travel. We want you to travel more AND enjoy living your everyday life in the meantime. So, in partnership with American Express, we’re sharing an Ultimate Hacks Guide – easy ways you can save money on everyday expenses (+ those treats), as well as how you can earn extra perks to travel more and create better memories. Within these hacks, we’ll also show you clever ways the American Express Membership Rewards program can help you achieve that little bit extra through clever points’ management no matter your disposable income. Let’s revisit what I feel are the foundational money principles are for helping you spend less and gain more. When you tune into your values, that is, what’s important to you and what you want to create, you’ll rarely go wrong when spending your money. Knowing your values will reduce your expenses on things you don’t care much about, and stop you spending money on things just to impress others. Love money and learn how to manage it and respect it. Remove feelings of fear, shame, and guilt around money – these will cost you a lot and will trap you into cycles of self-sabotage and unconscious (and unhealthy) spending. Be grateful for money – no matter your position in life. It helps provide you with needs and wants to live an amazing life. There’s nothing that can help you more to save and grow money than having a good relationship with it. If you follow those two principles, you can’t go wrong, and your spending won’t encourage greed, nor your feelings centered on lack. There are an infinite number of ways you can save money on travel. 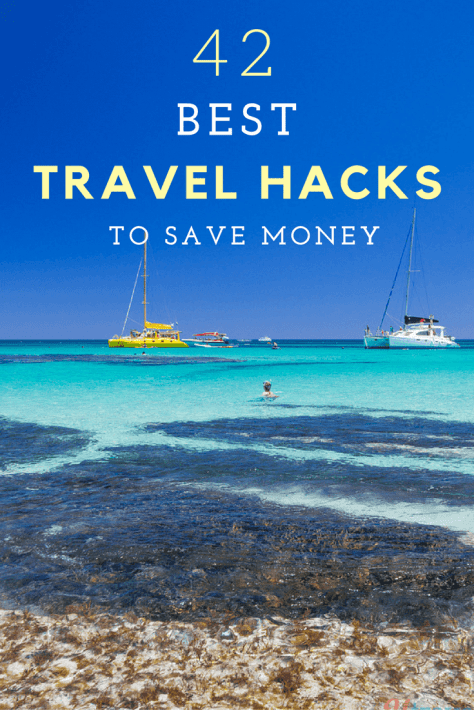 Here are some of our best travel hacks for finding cheap flights, accommodation, transport, and on the ground travel related costs. Use your Membership Rewards Card to pay for your living expenses + travel expenses. Set up a direct debit from your bank to pay off the balance each month. We recommend paying it off in full! I can’t tell you how much we save on travel + how many perks we get for following this strategy. It’s almost like money for nothing as you’re paying for these expenses anyway! It’s the fastest way to gather points you can then use those points to live life well. We put those points towards travel, but you can put them towards other luxury items as outlined in this post. Airlines track your behaviour via cookies, which means if you return at a later date to grab that cheap flight you found in your flight search, they’ve noted your interest through the cookies previously and so will, this time, return a slightly higher price for your flight. #cheeky You can get around this by clearing your cache or enabling private browsing. Flights can be different prices depending on which country you book from. Use a VPN – a Virtual Private Network – which makes it look like you are in another country. You can select a VPN from the US, UK, Germany, Japan, etc. to find the lowest price and book through that VPN. It may take time, but you could save a substantial amount on flights. Use search engines like Skyscanner, Adioso, and Google Flights who will scan the airlines for you and bring you comparative rates. You can purchase the best deal directly from them. OR, after finding the best deal, go direct to the airline’s website to see if you can get a better deal. You can then also check to see if you can reduce the price or get free upgrades with your frequent flyer or membership points. Check your favourite airline first. If the price is right, it’s always best to fly your favourites and stockpile those points each time you fly. I can’t tell you how many flights we’ve paid for using frequent flyer points. You can collect them each time you fly – as long as you’re a member of that frequent flyer program. Or, you can collect them using our first travel hack – use your credit card to pay for all expenses. You’ll be surprised how quickly they accumulate. Craig just used his frequent flyer points to pay for his flight to South Australia. We get several flights per year, including international, due to our frequent flyer points. American Express Membership Rewards program has over 10 Airline Partners you can transfer your points to. We usually try and consolidate our points to Qantas, but our current Card doesn’t have that option – but we can transfer to Velocity (Virgin), which we use frequently. If there’s a seat available with Webjet, your points can pay for it, or a combination of points plus pay on your American Express Card. When we pay our annual fee each year for our American Express Platinum Edge, we get a free domestic flight on Virgin. Our friend, Mel, has used her one before to visit us on the Goldie – yay! I used mine the other day for my return flight to South Australia. If you’re paying fees, find ways to make them work in your favour. Plus, when you create a new account with American Express you get a bonus 10,000 points. You can use those points in multiple ways as outlined in this post. Some airlines don’t operate in the same alliance or have a codeshare agreement, which means they might not show up together on flight searches even though the option is available. TripCombi uses an algorithm to search connections from nearby airports or between two airlines to track ‘hidden airports,’ as the team calls them. These flights can often offer better rates and connections. Some airlines have certain days of the week where they will release their sale fares. For example, Virgin Australia has its Thursday Happy Hour, which is an exclusive sale for discount flights that you can access only by signing up for their email alert and Jetstar has Friday Frenzy with great sales to domestic and international locations each week. Don’t go looking for things to complain about, but if something legitimately goes wrong on a flight, reach out to the airline to express your disappointment and explain the situation. Often you’ll receive credit. I complained to Jetstar once about the rude staff, and I received a $100 credit. It wasn’t why I complained; I didn’t even know that would happen. If you’ve got plenty of time up your sleeves, this is one of my favourite travel hacks. Plenty of airlines overbook their plans with the hopes some people won’t show up. If they’re too full, they ask for bump volunteers. They’ll get you on the next possible flight as well as giving you perks like free flights, credit and accommodation vouchers if the next flight is not until the next day. Search Kayak for the flight you want, and check the price predictor. If the flight is more than 3-4 months away, set a fare alert, and watch the price. When you find a price that works, try to book it on a Tuesday or Wednesday when prices are typically lower. To make the hack work even more in your favour, head over to American Express Travel and pay the flight with as many points as you have. If there’s a balance left over, use your American Express card to pay for it and collect more points! Some seats on each flight are kept aside for frequent flyers to effectively ‘buy’ using points. These can be seven times less than the Points plus pay seats which are available. These are best suited to solo and flexible travellers. Qantas has the option to bid for your upgrade. The last remaining unsold biz class seats are put to auction with the highest bidder wins! Take your chances! Craig worked for Delta in North Carolina for two years. We had standby free flights including flights back to Australia. It was such a shame that they only had space remaining in business class! Free food, drinks and Wi-Fi plus TV, desks and comfy chairs away from the chaos. I didn’t even notice my flight was delayed by almost three hours on my return from LAX. I was lapping up the luxury in the Qantas Business Lounge. Check your frequent flyer program status to see if lounge access is included. American Express grants eligible Card Members two complimentary airport lounge visits each year to the Sydney International lounge. We stayed in Denver, Colorado recently using hotel reward points, saving us around $300 a night. It’s beneficial to sign up to hotel chains loyalty programs. Get on their email list as they often have special deals come out for their members such as double points and free upgrades. It doesn’t always have to be direct with that hotel chain. American Express Membership Rewards have two Hotel Guest Partners. You can transfer your points into your preferred program and book directly with the partner. Some hotel chains, like Ritz-Carlton and Sheraton, have Club Lounges. You may get access to these depending on your program status, or you can purchase a pass with your points. These club lounges have free food and drinks. We saved a lot of money eating out when we stayed at the Ritz in Denver as we could eat in the Club lounge! Don’t be shy to ask for an upgrade when you check in. We often get upgrades without even asking. Hotel chains will often upgrade you if they have space as they want their customers to have incredible experiences. Golden Rule – be kind, courteous and friendly. It’s just karma baby! Ask the accommodation what is the best price they can do. They can often reduce the rate for you if you book directly with them. 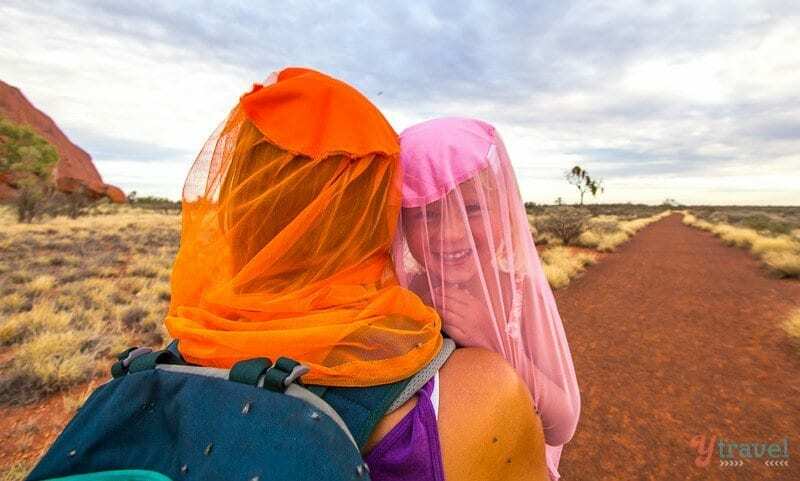 On our road trip around Australia, we often asked the caravan parks/hotels upon check-in if that was their best price. We’d often get the kids thrown in for free! If you don’t ask, you don’t get. Airbnb is my favourite way to book cheap accommodation. Plus, you get to live like a local and have the facilities to cook your food and save more money. Apartment rentals often come with free Wi-Fi, are in good locations, and other perks, like tea and coffee, use of kayaks and bikes, and a local’s guide to the area. I stayed in an Airbnb in LA, and the host even offered transfer services to the airport which were on par with Uber prices. She was also a wealth of inside knowledge, and it was way cheaper than staying in a hotel – by at least $1000 in total. If you’ve not used Airbnb before, sign up now via this link to receive $42AUD/$32USD off your first stay. 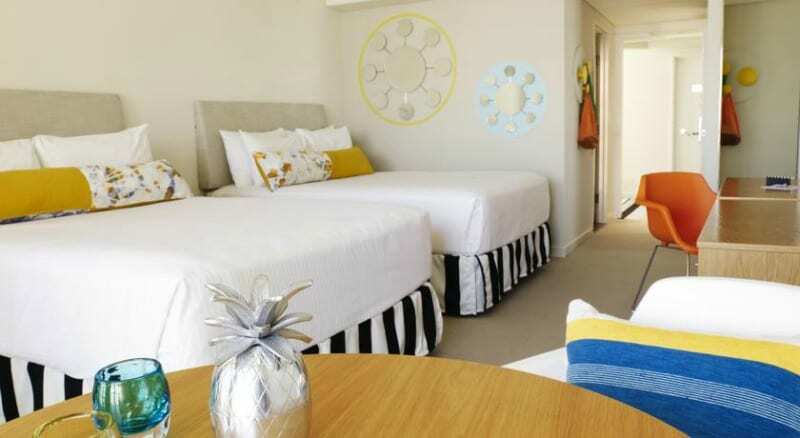 Two for the price of one, discounted rates, kids stay for free – there are multiple ways to find cheap accommodation. Travelling outside of peak times will give you the biggest chance. Stay connected to your favourite hotel chains and search engine providers via email or social media to quickly grab the deals as they come through. As outlined in this post, I used the American Express Travel booking service on their website to book flights, accommodation, car rental and even tours. I found their deals very comparable to other sites, if not better – they had some great discounted deals on accommodation! You can book using points, or a combination of points + pay. If you use up all your points, and still have more to book, you can pay for whatever’s left with your American Express Card and collect more points for travel! With American Express Travel Online there are no restrictions, no blackout dates, and no fees. Simple. For some eligible American Express Cards offer a complimentary Travel Credit, which can be used to book eligible prepaid flights, hotels or car hire when booking with American Express Travel Online. Grab your mates, your extended family or multiple families and rent out a luxury house. The initial price may seem huge, but when you split it per person, it will often end up cheaper than staying in a cramped hotel. Now you’ll feel like the rich and famous; you can all throw in to share food costs, which means you can go a little more deluxe with your food choices – don’t forget the champers and morning mimosas! 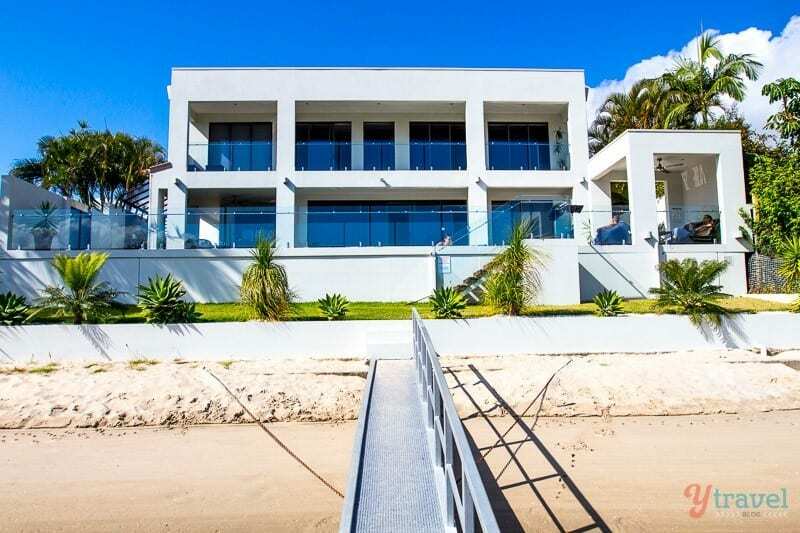 We stayed in a luxury house on the waterfront on the Gold Coast with 14 of my friends for my 40th. We recently shared a new search aggregator by Travelex that helps you find luxury holidays for less and breaks it down into flight, accommodation and currency costs according to your budget. You’ll be surprised by how far your money can go. There are plenty of travel destinations or experiences (like cruises) that offer all-inclusive deals, which can be a great way get more for your money. You know how much to budget before you go, your food, accommodation, and sometimes alcohol and activities are all included. 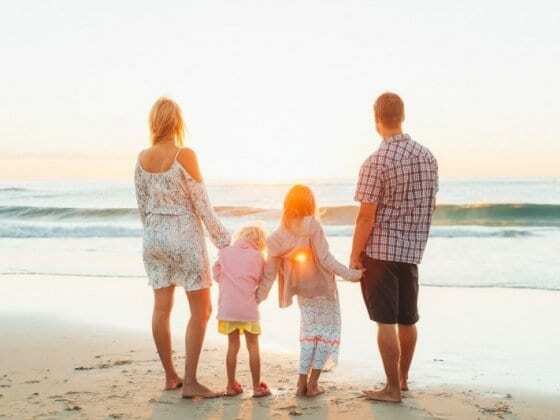 All inclusive holidays are suited to those type of holidays where you don’t want to do too much but relax and spend time with those you love, rather than exploring, adventuring and tasting the local life. Cruise ships often have to relocate to start a new itinerary or season. Instead of sailing the ship empty, they sell discounted tickets – on average up to 50% off. 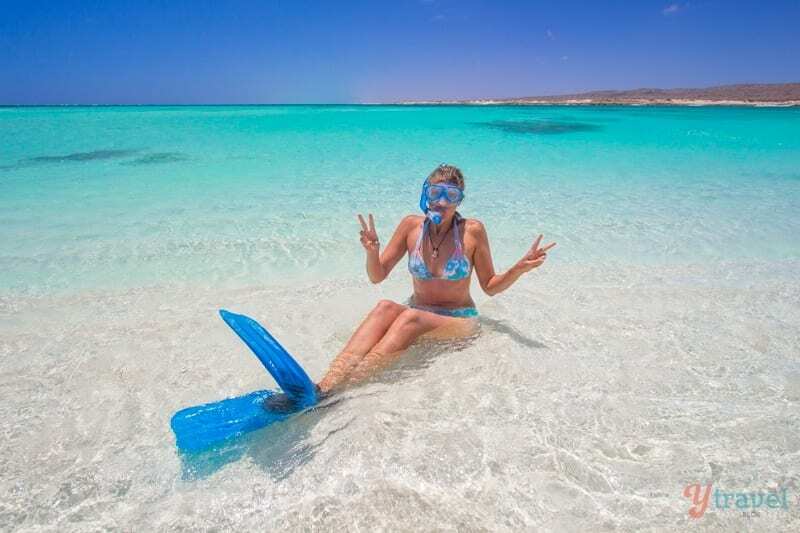 Repositioning cruises travelling to and from Australia frequently stop in Tahiti or travel via Hawaiian ports such as Honolulu, Lahaina, Kailua, and Kona. Other repositioning itineraries that journey to and from Asia include ports such as Singapore, Bali, Kota Kinabalu in Malaysia, and Puerto Princessa and Manila in the Philippines. If you’re planning on a one way trip to a destination, this could be a cheap way to get yourself there, making the journey part of the travel adventure. I considered it as an option to get to Hawaii on our America Unplugged road trip, but couldn’t find anything to suit. Travelling business or first? Top tier airlines such as Qantas and Emirates offer complimentary chauffeur driven transfers to and from the airport on selected major flights. If you have a big travelling party, it might even be worth you investigating the price of this in comparison to other forms of transport. Go lux for less when you can! 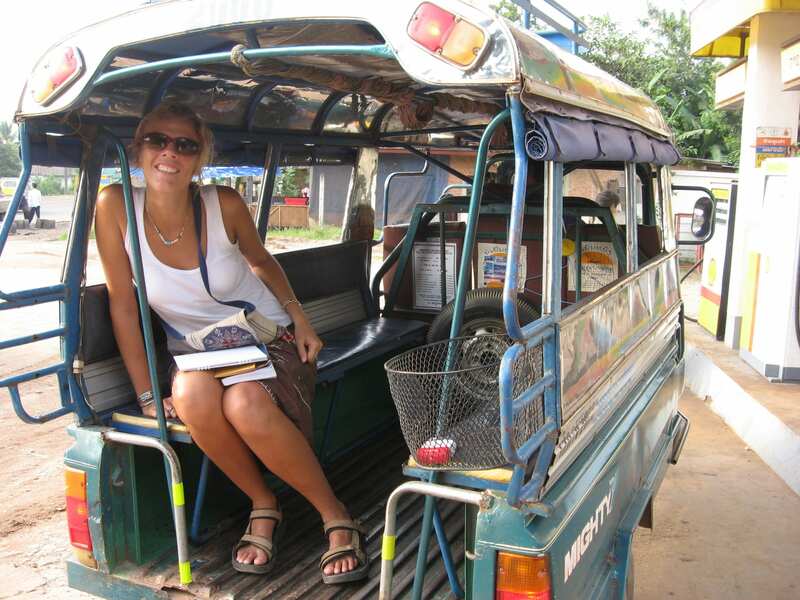 riding a tuk tuk in Laos is cheap! Check the prices of your trip compared to buses, trains, and taxis. Now we almost always grab an Uber from Sydney Airport into the city. It costs around $50, sometimes less. On the train, it costs $17 one way per person and $14 for the kids. Rome2rio is a trip planner that maps out all of the available transportation options between destinations. Enter the name of any address or landmark to see the best available flight, train, bus, ferry, and driving options, with estimated travel times and fares. RideGuru is a online tool that helps compare taxi and rideshare services so you can find the most economical choice for you. I currently have my eye on car relocation rental deals from Brisbane to Sydney. We leave our apartment on the 15th October to begin our new nomadic life with the first stop planned for our hometown. Relocation rentals are when you help out a car rental company by driving back one of their one-way rentals. You get a super cheap rate – some for as little as $1 a day. Some even include fuel and no booking or admin fees. But, you do have to be quick to jag a deal! A lot of private auto insurance policies and many major credit cards provide coverage for rental cars, particularly when rented for personal use (as opposed to for business). Check their policies just to make sure, but the chances are good that you can skip the expensive insurance coverage offered by the car rental company. Check out local tourist brochures and sites to find local car rental dealers. After we ditched our car in Burleigh, we found an ad in the local tourist brochure for Jacks Rental. Their prices were lower than any other rental company and online booking site PLUS they drop off and deliver the car to your accommodation. They are the BEST and we use them every time we want to hire a car. Better price + convenience = travel bliss. Many major cities will have travel cards. You buy a card and top it up with money to tap and go on various public transport. They will always be cheaper than buying a direct ticket. You can often find special days or times where cheap or free transport deals happen. Sydney used to have Family Fun Day – $2.50 per person all day for families to ride public transport unlimited. Sunday was our day to explore Sydney from the Central Coast. On any other day, the ticket for one adult return was $16. 99 percent of the time your bank will have the best possible exchange rate. Save time and money by using the bank rather than currency exchanges. Grab money — in the local currency — from ATMs, or pay with a credit card to save time — and your hard earned cash. Withdraw large amounts of money at a time (an amount you feel comfortable carrying) to avoid excess fees. International transaction fees on your credit card can add up so check fees and come up with the best plan to find a balance of withdrawing money to using your credit card. We use both. We like using the credit card, if it makes sense, so that we can accumulate more reward points. My friend just returned from Canada and was stoked with the amount of American Express Membership Reward points she accumulated from using her card as almost all vendors accepted it. I used my Qantas Cash Card while in LA for purchases and collected frequent flyer points each time and no fees. So this is a benefit I’ve just discovered while writing this post. You can step into an American Express Currency Exchange store and redeem your points for over 60 currencies. So cool!! If you are following our travel hack to use your card to pay for all your everyday expenses, you’ll be surprised by how much spending money you are accumulating with those points. 12,000 Membership Rewards points = 100 AUD worth of foreign currency or traveller’s cheques. I currently have $100 in points waiting for me to exchange. Money for nothing – I love it (Well not really nothing, I got it for buying my groceries and supporting my coffee addiction). If you’re sightseeing, city passes or tourism cards often give you access to discounted prices and free transportation to a city’s best sites. With all of the apps we have available today, taking overpriced tours can become a thing of the past. Apps like Field Trip notify you when you hit a point of interest while walking. The app also scouts out offers and discounts that happen to be nearby. There are many cities that offer free local walking tours. Just search in Google for them for the destination you are visiting. Use apps like Skype, Viber, Tango, and WhatsApp to phone your loved ones. On my recent solo trip to LA, I loved picking up the phone whenever I wanted to call Craig and the girls on Skype. Be careful of your data allowances as these can’t work without internet connection! A new app revolutionising the international phone calling world is Rebtel. Their calling app allows users to make international calls without the use of Wi-Fi or data by connecting to the company’s connection points in their server. Use free Wi-Fi (don’t forget to protect yourself with VPN) Get local SIM card or services like WiWander and Tep Wireless. Don’t travel without travel insurance. It could save you a lot of money. World2Cover Insurance covers children for free. If you purchase your holiday on your credit card, you may be available for free travel insurance. Check with your provider. Some American Express Cards include certain domestic and international travel insurance benefits if you pay for your trip using your Card. The suburbs is where you’ll find cheaper food, and accommodation, a more hipster and eclectic vibe and the opportunity to live like the locals. Ask the locals where the best places to go are and TripAdvisor is also a good place to find recommendations. Spotted by Locals is an app full of local recommendations for places to eat and drink and things to see and do. You’ll find some great suggestions a million miles away from any Lonely Planet tourist guide. Check coupon books and local advertisements and keep your eye out when out exploring. You are bound to find a special deal somewhere for eating out. We take advantage of these all the time when travelling. Happy hours, eating earlier, kids eat free evenings, free drinks and appetizers. It’s a great way to taste the local flavours and walk away with more in your pocket. Why not get fit, follow your own path, and explore your destination by bike. It is our favourite way to get around and save money on expensive tours and sightseeing costs. 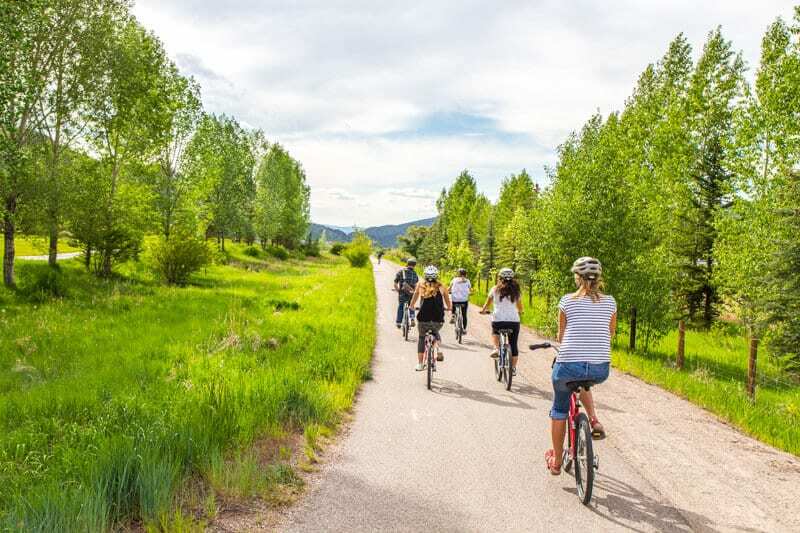 We loved using the bike share system in Denver and found it a cheap way to explore. Many cities now have these as an exploring option. If you can, travel with your bikes. Apart from my high-speed blender and UGG boots, our bikes were the BEST thing we took with us on our road trip. It will be one of our first purchases for our US road trip. Forget the saving money aspect, you gain so much joy and create memorable moments when exploring by bike. I was devastated the other night after forgetting to bring mine to the movies and was charged $6.50 for water. For WATER!!!!! Carry your own water bottle and fill it for free. In countries where tap water is not safe to drink, carry a water filter. It will save you a LOT of money. I was wondering how you can pay for so many things on Amex when most businesses (esp. small ones, some supermarkets don’t) in Australia charge around 2% to pay with Amex. It costs me $119 or 23,800 points each year in annual fee,for my Amex, that means 1 dollar is worth 200 points. So if you pay for something that costs $100 dollars you would get 300 points but if you are charged 2% that’s $2 or 400 points, so in effect your paying $2 (400) points to get 300 points. Or am I missing something here? That is my biggest issue here in Australia that I can only use my Amex and accumulate points when there are no fees otherwise the fees outweigh the points I would earn and mean I am loosing money. Paying for flights is probably the worst as most airlines charge around 5% for Amex instead Poli pay (a direct bank transfer) is free!!! My mind naturally wonders if Amex has backed your blog??? Also, I am just about to posted a blog about the cheapest way to leave Syndey airport and avoid the expensive train fee that comes with catching the train from the airports. If you are getting a Uber for $50 to the city you’re paying to much! I can half that cost for you!!! Get a Uber from the airport to the closest train station (mascot or Woli Creek) for $12 then get the train for $2.36 or $3.38, depending on peak or off-peak time. If there were 4 adults for example and even if it was peak time it this method would only cost you $25.60 in totally for 4 ppl! Much, much better than a $50 Uber all the way to the city. Better still it would cost $21.60 at off-peak times and even less if you have children Opal cards! How good is that! I have spent a lot of time researching how to save money on Sydney Public transport. Lastly, I disagree that it is cost effective to use cards and an ATM to get cash when overseas. I disagree that the bank cards give you the best exchange rates. Firstly Amex charged another few percent (about 3% from memory) for international use which means I never use my Amex overseas and if you withdraw from an ATM you will be charged from $2-$20 depending on your bank. That’s crazy! I often do my research when I arrive in a new country I will withdraw some cash with my travel card and see what rate they give on my statement. Then I will check the cash rates at exchange offices and then I take into account the ATM withdrawal fee and the rate I can get with cash is almost always better than my banks exchange rate at the ATM. 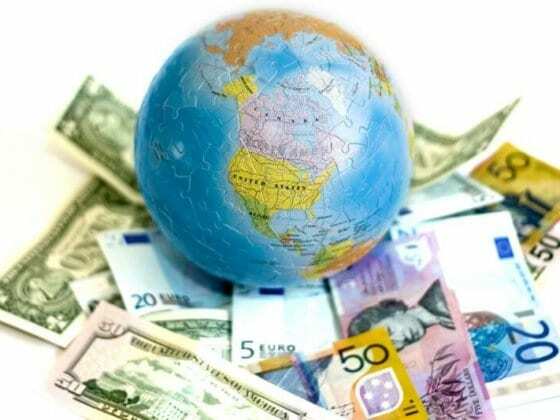 The right advice that we should be spreading, I believe, is to do your research for each country/Currency you visit/use, there is no set way to save money when getting local currency it changes from country to country. Just last month in Samoa the best exchange rate was at the airport! I checked all the exchange offices in NZ before I flew over, the best was 1.7 for NZ$. My ASB bank was exchanging my NZ$ for 1.7 if I withdrew cash from an ATM plus a fee ($2-$5). On line, EX.com said 1.823 and when I got to the airport all three exchange offices offered 1.82 with no fees!!!! We have all been told “never exchange at airports” so naturally, I thought “wow if that is what they offer at the airport, how good will the exchange rate be in the city!” I went to the city, to an exchange and I could only get 1.77! Even the ANZ and South Pacific bank in the city, who are 2 of the three companies who have exchange offcies at the airport were not offering the same high rate as the airport. I said “can you give me the same rate as your office at the airport?” and she replied “unfortunately not, the airport has special rates, they are always the best, everyone knows that”. I was stopped in my tracks suddenly. Then I started to laugh. I couldn’t do anything else but laugh at the killer irony she had just highlighted. I didn’t know and I did a lot of research to try and find out. The rest of the world is always told by travel bloggers, the “experts” never to exchange cash at airports. I can’t find one travel blogger who says “actually some airports do have the best rates” I would love a blogger, to tell the truth (instead of pushing their sponsors cards) and say “there is no set rule when it comes to finding the best exchange rates, each destination is different, the best tip is to do country specific research”. Thats about to change. There will be one blog, mine. Travel bloggers and the travel industry tell us one thing “never exchange at an airport” but it turns out some airports DO have the best rates! Wow epic reply. Thanks for all the useful tips. I’ve never found the currency rate to be better at the airport. Every time I’ve exchanged at the airport I’ve lost money and found much better exchange rates elsewhere, including my bank. It’s great that you’ve found something different. Thank you for sharing. As mentioned in the post, always check first the fees for using your cards overseas and withdrawing money. I never ever withdraw money from my credit card overseas or not as cash withdrawals mean you pay interest immediately and often more so. As mentioned, I also use my Qantas Cash card for purchases overseas. My research has shown they are the best money travel card around. Great tips on the Uber into the Sydney. I’ve not tried that. Mostly as I don’t have time. I’m okay with getting an Uber straight into the city. I’m not going to penny pinch so much but others might so thank you. For me the Uber straight into the city is cheaper and way more convenient especially when travelling with kids and dealing with lugging luggage in and out as well as children in and out. I’m not sure if you have kids but believe me you decide either trains all the way or Uber for sanity purposes. In regards to Amex. Simple. Don’t use that card to pay for purchases when they charge a fee. Before we make any purchases we ask, “Do you take Amex?” “Is there a fee for that?” If there isn’t awesome – we’re finding more and more places are no longer charging. If there is a fee, we use another card. In regards to paying for flights, Poli is better as there are no fees. Using any kind of credit card to pay for a flight will incur a fee, it’s not just Amex. And yes, this post is sponsored by Amex, which is clearly disclaimed. I have no problem with it. We love Amex and have been using it as our preferred card for about 9 years, long before we started this blog. We’ve also worked in partnership with Amex now for about three years, which our long-time readers are well aware of. We only align with brands we love and use ourselves. Amex is not a card for everyone. Each person has to do their own research. But they suit a particular type of consumer. Despite the fees, we still think the card is great. Amex has a lot of travel perks, a great brand and excellent customer service. We can’t wait to move to the US so we can get even more from it. These are great. I think the biggest and best change is the one: “Change your Attitude about money”. It’s a lot easier to save money when you compare how much money you would pay for a new pair of shoes (that most of the time – aren’t needed) versus putting that in a travel savings account! I’ve saved myself from buying countless items by taking a second to think about whether its worth it, as opposed to whether I want it. Great article, keep sharing! Absolutely Katy!! I always use the walk away trick. If I find something I want to buy (I only ever shop for clothes if my ones are falling apart!!) 95% of the time I contemplate, and then walk away. If, after some time, I notice that the desire for that has waned I keep walking. Or, if it keeps rolling around in my head and I feel it in my body as something that is in alignment with my values and can’t stop thinking about, I’ll often go back and purchase it. But, only if it is needed or can’t live without. 5% of the time I know that it’s a definite buy and will grab it. But, I don’t purchase unless I have the money for it. I’ve gotten into credit card debt before and it’s ugly. Nothing is worth that. You can’t travel with the chains of debt! Some good tips in there and I’ve added it to the “saving money tips & resources” shared board on Pinterest. With regards to Airfare specifically, I have a detailed guide of my own on how to get the best price on those. Some great travel hacks here. They only thing I don’t quite agree on is that one should love money. Money is worthless piece of paper that has no value and should neither be loved nor hated. But, it’s also how we get things to survive and thrive, so it does hold value. You can’t ignore it and say it’s not important. Most people have an unhealthy relationship with it, and so create lives that don’t make them happy. You learn to love and respect it in the right way. i teach how to do that in my Money Cleanse. thanks for sharing so many useful and informative tips – who doesn’t want to save money right? Like anything, not everyone will agree with everything, and that’s cool. People are missing the point if they think it’s a 100% agreement, all one needs is one of two to work for them and they’re already #winning. I like how you’re bold enough to open yourself up honestly and it gives your blog a unique voice. Thanks so much! I agree. Take the tips you love, leave the tips you don’t think will work for your situation. At least one of these will save you money! There’s nothing better than getting free flights!! We can’t wait to hit the US and take advantage of the credit card miles. Way better than what we have in Australia. We’re quite limited with our hacking here. I totally agree with getting cash overseas via ATM withdrawals. HSBC premier allows international withdrawals with no transaction fee, so you don’t even have to worry how often you withdraw. I am not so sure about your tip for free tours. Whilst some cities do offer official free tours with authorised guides, claiming to be a “Free Tour” is the latest gimmick in the tour industry, often operated by unlicensed guides who frequently are not even local (i.e. other travellers). These tours are free other than the service fee that is expected at the end of the tour, which is really just a different way of pricing a tour. It is all fun and cheap until something goes wrong. Extremely comprehensive list! I would add another point here, travel planning on budget requires a tool that can find the most suitable destinations, hotels and flights within your budget. There are very few platforms that do this all in one place. Do try http://www.metripping.com/ when you get a chance. It is a great way to discover amazing destinations, and also find some good prices as it compares prices from across 1000+ sites and 100,000+ properties in the world. The tip to clean the cache is great. I’m surprised as most people do not know that. Great, tips, some I did not know. A ridiculously GREAT article. I’ve traveled lots and thought I knew lots – but this info was just perfect! Thanks guys!! Naught naught airlines. I’m always telling my friends about this trick and about how to avoid paying higher airfares. The VPN trick also works for car hire companies as different countries get different car hire rates. Some really wonderful tips here. I’m going to start a trip to Europe in a month. I will travel at least for 6 months and these tips will be a great help. As an Australian, I have just discovered that, if you are travelling for more than 8 weeks, you can often temporarily pause your health insurance. I’m planning a big trip next year and this will save me double the cost of my travel insurance – bonus! I’m wondering if other home services will also allow you to put them on hold while you are away. Maybe worth checking out?